Every day, keyboard operators, grocery store clerks, assembly line workers and many others, receive micro-traumas to their hands and wrists. 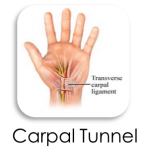 Vibration and repetitive motions, when combined with spinal problems and other joint dysfunction, can result in a condition known as carpal tunnel syndrome. 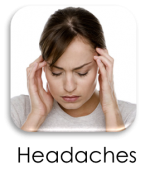 Symptoms may include pain, numbness, tingling, weakness, or a loss of strength in the hands. The major nerve controlling the thumb, index, and parts of the middle, and ring finger is called the median nerve. From the tip of your fingers, it travels through the bones in your wrist, past your elbow, up your arm, through your shoulder and neck, and finally to your spinal cord. Problems can develop in one or more of these areas. 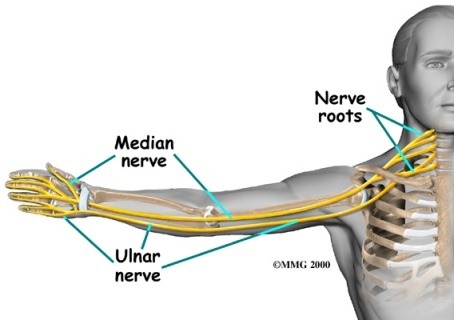 Nerves that pass through the “carpal tunnel” originate from the spine in the lower neck area. They travel all the way down the arm to the hand. If placing your hands back to back produces an increase in numbness, tingling, or pain, you could have a carpal tunnel problem. Have someone try to pull your thumb and finger apart. If your fingers seem weak, it could be related to a carpal tunnel problem. Specific, high precision chiropractic adjustments anywhere along this nerve pathway can help return malfunctioning joints to a more normal position and function.